I could only find 9 that qualified , so have included 2 ring ins ! Has anyone got any others Ive missed ? That's a fair effort, Scrappy. He also won North's best and fairest in 1902 - A premiership year. I came across a photo of him recently as he played in the first SA cricket team to play in WA alongside my Great Grandfather. Why did he get selected ? * No other city in Australia has produced so many champions at both cricket and football as Adelaide. Wheras other capital cities have an occasional dual star, the city by the Torrens seems to have an ongoing supply. He was one of the stalwarts of Norwood in the 80s, and a capital kick, indeed the old football club song included a couple of lines setting out his prowess. Wicketkeeper Jack Mckenzie came from the Port and was well known for his peculiar leg flick when batting as for the keeness of his keeping, And couldnt he kick a football ! I wonder what Alby Greens famous telegram was ? One hoodlum in the crowd, who had lost his temper, and probably his money as well, made a rush at the umpire, and while they were engaged,a mean, contemptible ruffian kicked the umpire on the side of the knee, completely laming him. What a manly action ! But why did they not make any arrests? Thats bad, but as bad as this 61 years later ? "A good football match in Melbourne is one of the sights of the world"
"Of course there are numbers of people in the upper and middle classes who still have a holy horror of football as a dangerous game." Oval since John Creswell (Secretary of the SACA) first promoted the idea in 1885. The result was a victory to Medindie as they doubled the score of the visitors (4 goals 4 behinds to 2 goals 2 behinds). The Advertiser summed up the game as such…. Two weeks later two players from Point Macleay - Alfie Spender and Harry Hewitt - lined up with Medindie's league side, and were named in the best players. Hewitt also played some games with Port Adelaide. North Adelaide and West Torrens Clubs were called by the Advertiser ''subsidized encumbrances'' to the dominant South Adelaide , Port Adelaide and Norwood clubs. Was Football in the mid 90s reaching a crisis point ? After reading about this article perhaps it might have been true ? No doubt a team from Point Macleay would have been competitive in Adelaide and Suburban Association (the 1880s version of the seconds). A tragedy happened at Milang late last night or early this morning amongst the blacks camped near the town, and as a result Harry Hewitt, an aboriginal, well known both at the Point McLeay Mission Station and in other parts of South Australia, was killed. There had evidently been a great disturbance in the camp, during which fierce fighting occurred. The police on visiting the place this morning saw evidence everywhere of the battle, and they found the body of Hewitt, who was quite dead. An examination of the corpse disclosed the fact that there was a large hole in the skull, which had apparently been caused by a terrific blow. As a result of the enquires made among the natives the police arrested an aboriginal known as Tommy Lawson on suspicion of having struck the blow which caused Hewitt’s death and he is at present in custody on a formal charge of drunkenness pending the outcome of the coroner’s inquest. Hewitt, who was about 40 years of age was well known in South Australian athletic circles. About twelve years ago he played or a cricket team in North Adelaide, who were known as the Cambridge Eleven, and he surprised his opponents on more than one occasion by his wonderful fielding. He would stop the hottest hits when the ball was travelling on or off the ground, while his return was both accurate and rapid. On one occasion Hewitt scored 144 not out against Prospect. Hewitt played for a Milang team on the occasion of a turf pitch being used for the first time on the Unley Oval. In the football season prowess as an all-round man when he was a member of the Medindie team is well remembered by old footballers. He was not misplaced in any position in the field, but his particular forte was in the following department. As an athlete Hewitt took part in numerous sports gatherings, while as a swimmer he was a mean opponent. Besides his athletic excellences Hewitt excelled as an acrobat and gymnast, and he was for some time connected with a travelling circus. He also took part in a variety show, playing in farces and sketches. The Salvation Army likewise claimed seine of his attention, and while connected with the organisation Hewitt attained the rank of corporal. He was recognised as one of the most intelligent South Australian aboriginals at Point McLeay. He could read and write, and was conversant with a variety of subjects which are usually considered outside the ken of an ordinary native. Hewitt was a most quiet and inoffensive man, and general regret is expressed at the manner of his sudden death. For the past few years Hewitt had been earning a living at Milang as a fisherman. 20,000 people at a venue you could say an out'stand'ing success initiated by John Cresswell. In game 2 , 4 Aborigines wore football boots ! Well done for all these, they make fascinating reading. * There has, it is true, been a little disquiet of late amongst the ranks of the faithful over the growing popularity of Association Football, or soccer. 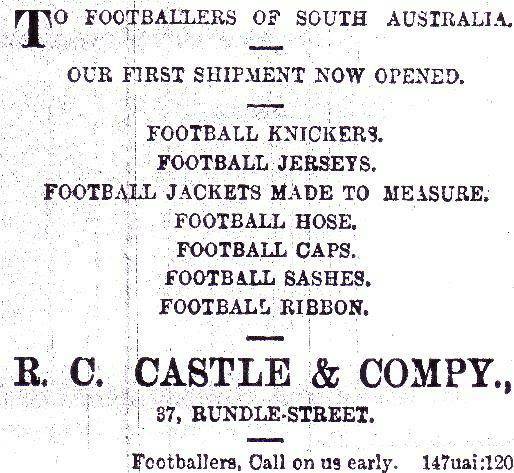 Im just imagining how things would have worked out if Soccer had a foot hole in Adelaide before Australian Rules [or indeed in Melbourne] ? Didnt like Ernie Jones drinking habits in 1899 ! Was known to wear a cricket hat when playing football ! Have read his father played first class cricket as well !
"" A superb player, the finest left hander ever, shortish, thickset, powerful, swift on his feet, a master of attack or defence.""